New analysis suggests foreign exchange market participants are approaching Pound Sterling with a too much optimism following the revelation that the Bank of England could raise interest rates in 2017. If anything, a Bank of England interest rate rise will be bad for the economy, and Sterling. These are the findings of UK high-street lender HSBC after the Pound saw fortunes improve towards the end of June with gains coming against a host of currencies after Bank of England Governor Mark Carney told a conference of central bankers that "some removal of monetary stimulus is likely to become necessary" in the future. The conventional wisdom has it that rising interest rates are supportive of a currency, “in a cyclical world”. “Those who advocate a rate hike believe the combination of high inflation and low unemployment – two cyclical considerations – warrants action,” says HSBC Strategist David Bloom (pictured above). Even in such a cyclical world, Bloom argues the case for rate hikes in the UK are not clear cut – a lot of economic activity data (e.g. wage growth, retail sales) have disappointed in recent months. But for HSBC, the dominant issues for the UK are structural and political in nature. “In the structural and political world that GBP inhabits, we believe rate hikes could be damaging,” says the analyst. Bloom argues that GBP’s weakness in the last year should help an economic transition, causing higher imported inflation and a squeeze in real incomes, thus leading to narrower trade and current account deficits. Ultimately the elimination of the current account deficit - i.e the deficit created by the fact the UK imports more than it exports - is what will put a final floor under the Pound and allow it to recover on a sustainable, long-term basis. But the process of fixing the current account problem is far from complete. Additional, albeit gradual, depreciation in the exchange rate is required to rein in these imbalances which would see the UK export more and import less. Indeed, latest current account data shows while it is falling, the UK’s deficit in the trade of goods and services remains sizeable, despite the recent falls in the Pound. 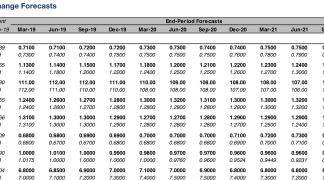 HSBC continue to believe that GBP is headed to 1.20 against the USD and to parity against the Euro by year-end. This is one of the more negative stances on Sterling held by the analyst community. (Download the full list of financial forecasts here, where you can view the expectations of 45 investment banks and brokers). “The last thing the UK needs in our view is an unnecessary rate rise being added to the already difficult economic and political outlook,” says Bloom. 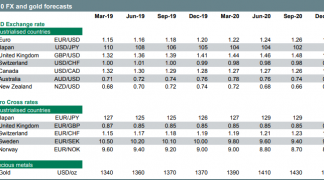 Politically, the currency remains vulnerable to a potentially acrimonious negotiation process with the EU and the lingering possibility of a ‘no deal’ outcome. Structurally, the renewed widening in the trade deficit is a recurring headache that requires more adjustment lower in GBP. Finally, there are some signs that the economy is losing traction, notably through slower consumer spending that has driven GDP growth lower. The view that the Bank of England is no 'knight in shining armour' for Sterling actually not unique amongst currency analysts; we have heard from other noted names in FX that a regime of rising interest rates is not necessarily in the Pound’s interest. Simon Penn, a trader at UBS, says that to raise interest rates now would have an all-out negative impact on the Pound. “It could be argued that raising rates would only make matters worse, causing the economy to slow more sharply and therefore undermining rather than supporting the Pound,” says Penn. Oliver Harvey at Deutsche Bank says the Pound could simply choose to ignore rising rates. Harvey lays out four reasons that suggest to him Sterling might not deliver the positive response to an interest rate rise that many Sterling-bulls are hoping for. 1) Sterling is highly sensitive to rate spreads and the correlations between the Pound and short-term yields are on the rise again after having collapsed at the turn of the year. Yields on debt tend to rise as the Bank raises interest rates. 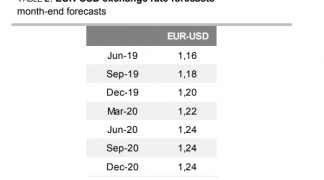 But the earlier breakdown saw GBP become expensive to spreads, “with 2-year nominal rates suggesting that GBP/USD is around 15 big figures above fair value,” says Harvey. 2) Sterling performance around Bank of England hiking cycles has been “ambiguous at best”. Since the inflation targeting regime was adopted in 1992, the pound has weakened into hiking cycles three times out of five. By contrast, Sterling tends to outperform after the cycle has already begun. 3) There is a difference between a withdrawal of last year’s emergency rate cut, and a full hiking cycle. Rhetoric from Haldane last week suggested that he saw the former as more appropriate. Market pricing has so far been consistent with this view, with the front-end selling off sharply, but little in the way of pricing further out the curve. 4) Rising UK interest rates should be set against tightening policy elsewhere which suggests the relative advantage of having higher interest rates are negated. For example, the European Central Bank is also shifting to a similar policy stance which leaves little chance for an appreciation in the Pound to Euro exchange rate as the two forces neutralise each other.